Yup, yeah, that’s right… It’s time for another DevHouse. Back in 2008 we managed to throw 3 DevHouses, but we slacked in 2009, and this is the first of the year, but 4th in total. Math is hard. 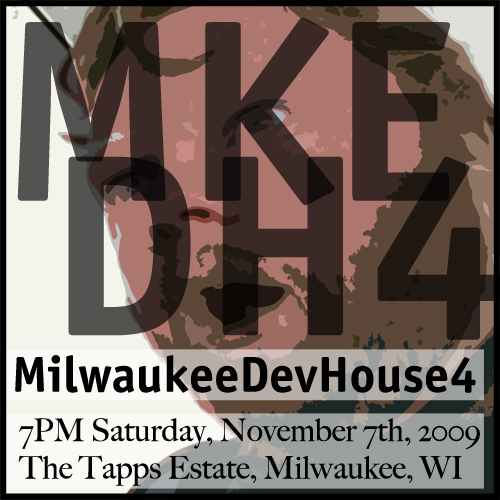 MilwaukeeDevHouse is relaxed, party-like atmosphere to hang out with friends (or make new ones!) and get things done… You know, that blog you’ve always been meaning to redesign, those photos you’ve been meaning to retouch, that Firefox extension or Drupal module that’s been sitting undone for 6 months. It’s like an all-night co-working session. At a house. Where a party is going on. Yup. Think of it like the late-night part of BarCamp where there aren’t sessions, but anything goes and people stare at computers all night long, hacking on who knows what. Our good pals at Bucketworks are helping us sponsor this event, so a big thanks goes out to them. Details? Yeah, we got ‘em… over at Web414. Posted on Thursday, October 15th, 2009 at 1:20 pm. Subscribe to the comments feed. Both comments and pings are currently closed. Post on your own blog.